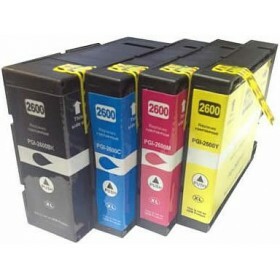 Note: The PGI 2600XL Generic cartridges use all PIGMENTS and not just dyes like many other generic cartridges assuring you of the very highest quality prints. FULL 60 Day Money Back Guarantee if not 100% happy with this product. Great cartridges, so much cheaper than the brand name ones and no noticeable difference in print quality. A great Aussie business. These Canon PGI 2600XL cartridges are fantastic, a fraction of the price that Officeworks are asking for the genuine ones and they work PERFECTLY. I'm so wrapped that I found you guys as I do a load of printing. Thank you. Great Service, cartridges arrived the very next day.